P-3817 AN EXCEPTIONAL VERAGUAS GOLD HUMAN FIGURE WITH COMPLEX HEADDRESS CIRCA A.D. 850-1350. Provenance: 1) Acquired from the Merrin Gallery, New York, in 1971. 2) The Sackheim Family Collection, New York and Florida. Exhibited: The Epcot Center Museum Program, Mexico Pavilion, from 1984 to 2015. 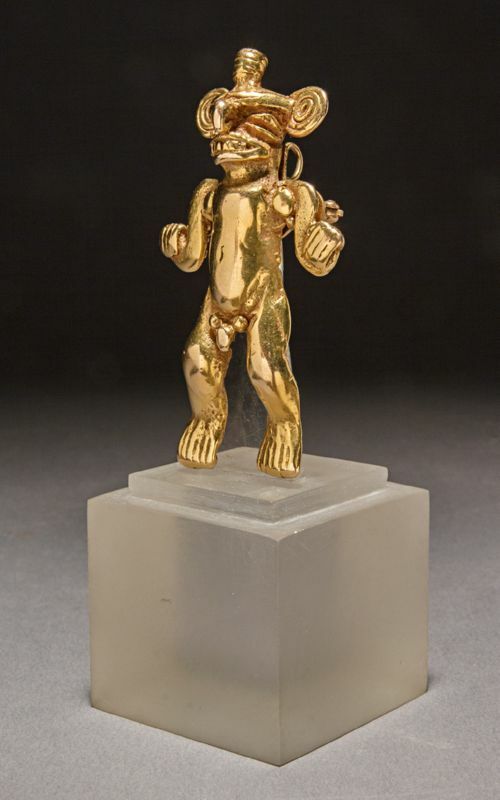 This humanoid standing gold male figure was made in the lost wax process of casting. He is adorned with a helmet-like regal headdress surmounted by a central crest decoration with spiral ornaments on either side, the aquiline nose protruding from it above a toothy open mouth, the hands cupped downward and held outward from the torso, the male gender indicated. A gold attachment with pin was added in 1971 by the Merrin Gallery to facilitate the wearing of ancient art in modern times.